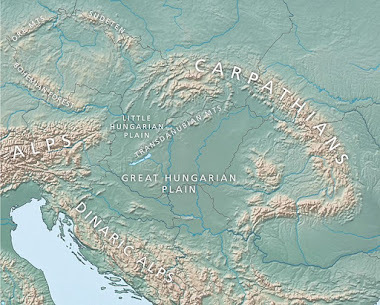 For many years the origin of the Slavs has been the subject-matter in archaeology, anthropology, history, linguistics and recently also modern human population genetics. By now there is no unambiguous answer to a question where, when and in what way the Slavs originated. For the purposes of this dissertation, the analysis of ancient human mitochondrial DNA was applied. The ancient DNA was isolated from 72 specimens which came from Iron-Age and medieval graveyards from the area of current Poland. Ancient mtDNA was extracted from two teeth from each individual and reproducible sequence results were obtained for 20 medieval and 23 Iron-Age specimens. On the basis of HVR I mtDNA mutation motifs and coding region SNPs each specimen was assigned to a mitochondrial haplogroup. 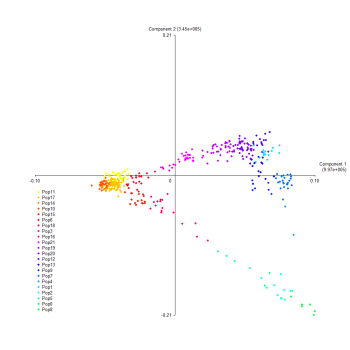 The obtained results were used together with other ancient and modern populations to analyse shared haplotypes and population genetic distances illustrated by multidimentional scaling plots (MDS). The differences on genetic level and quite high genetic distances (FST) between medieval and Iron-Age populations as well as significant number of shared informative haplotypes with Belarus, Ukraine and Bulgaria may evidence genetic discontinuity between medieval and Iron Ages. From the other side, the highest number of shared informative haplotypes between Iron-Age and extant Polish population as well as the presence of subhaplogroup N1a1a2, can confirm that some genetic lines show continuity at least from Iron Age or even Neolithic in the areas of present day Poland. The results obtained in this work are considered to be the first ancient contribution in genetic history of the Slavs. Below is an MDS from the thesis, based on data corrected for the effects of potential relatives in the Iron Age sample. I don't think it's a particularly useful way of judging the intra-European affinity of the two ancient Polish groups, mostly because the samples are small, and contemporary North, Central and East Europeans don't differ very much in terms of mtDNA. Nevertheless, we can see that both the Iron Age (Okres Rzymski) and Medieval (Sredniowiecze) samples fall within the range of modern European mtDNA diversity. 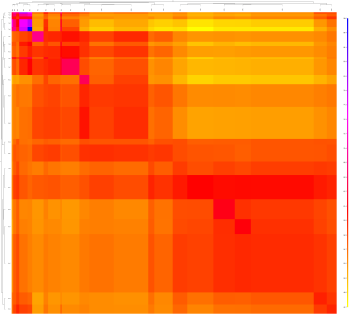 On the other hand, the German Neolithic LBK sample (Neolit LBK Niemcy) clearly does not, because it's sitting at the far right of the plot, away from the main European cluster. This dichotomy between the genetic structure of the LBK farmers and modern Europeans has been demonstrated in previous studies, but the reasons for it are still a mystery. Interestingly, modern Poles are closer to an Iron Age sample from Denmark (Okres Zelaza Dania) than to the Polish Iron Age set. However, as per the summary above, the author also compared the frequencies of the most informative haplotypes among the modern and ancient samples, and found that extant Poles are the closest group to the Polish Iron Age remains, followed by Balts, Swedes and Baltic Finns. Below is a table showing those results. According to the author, these matches might hint at Baltic, Germanic and Finno-Ugric influences in the Polish Iron Age population. Perhaps, but in my opinion, they're simply in line with geography, and reflect the general North European character of maternal lineages shared by populations from around the Baltic, both today and during the Iron Age. 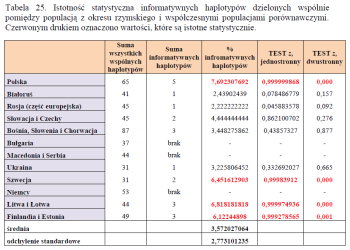 The results for the Medieval Polish sample are more intriguing, because they're somewhat out of whack with geography. Its best matching modern groups are Belorussians, Ukrainians and Bulgarians. This might suggest that, during the early middle ages, the territory of present day Poland experienced an influx of groups from what are now Belarus and Ukraine, who then melted into the gene pool of the natives of Polish Iron Age descent. However, conversely, it might mean that Belorussians, Ukrainians and Bulgarians descend in large part from fairly specific medieval groups from the area of modern Poland. In any case, whether present day Polish territory saw some migrations from the immediate east during the Medieval period or not, this preliminary look at ancient Polish mtDNA suggests long-standing genetic continuity in the region. What it clearly doesn't show is a complete, or almost complete, population replacement in the areas between the Oder and Bug rivers during the migration period. Indeed, the thesis results put into doubt past notions that the Przeworsk and Wielbark cultures were of Germanic origin. 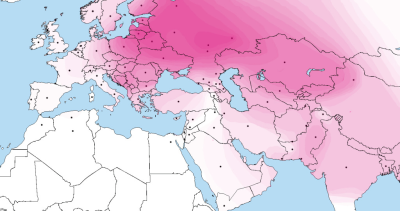 The (mtDNA) haplogroup missing from both the Iron Age and medieval samples from the territory of modern Poland was haplogroup I. In contemporary Slavic populations, this haplogroup is found at levels ranging from 1.2% in Bulgarians to 4.8% in Slovaks. It was also recorded at high levels in ancient remains from Denmark. It showed a frequency of 12.5% in an Iron Age sample, and 13.8% in a medieval sample. Melchior et al. 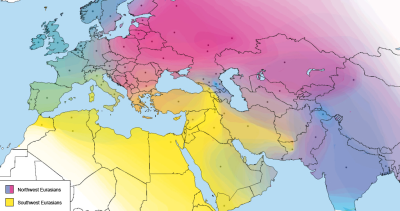 2008 suggest that haplogroup I might have been more common in Denmark and Northern Europe during that period. Therefore, the lack of this haplogroup in ancient DNA from the territory of modern Poland, might mean that the Przeworsk and Wielbark cultures should not be identified with Germanic populations. I'm sure more ancient DNA studies are on the way looking at the origins of Slavs and Poles. Indeed, if the Y-chromosomes of Przeworsk and Wielbark remains are successfully tested, I won't be surprised if they look fairly typical of modern Poles, with a decent representation of R1a1a-M458, which is the most common Y-chromosome haplogroup in Poland today. So who's the most (indigenous) European of us all? Basically, the first map below reveals the answer. 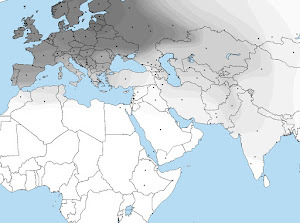 It shows the spread of a European specific cluster from a global-wide ADMIXTURE analysis at K=8 (eight ancestral populations assumed), which I call "North European". Thus, genetically, the most European populations are found around the Baltic Sea, and in particular in the East Baltic region. In my genome collection, samples from Lithuania clearly and consistently score the highest percentages in ADMIXTURE clusters specific to Europe. However, I suspect that if I had Latvians with no known foreign ancestry going back more than four generations, they'd come out the "most European". Hopefully we can test that in the near future. Below are the fifteen Eurogenes sample sets that scored the highest levels of membership in the North European cluster. The list only includes groups with five or more individuals present in the analysis, so some populations, like Estonians or Danes, weren't included, even though they easily made the cut. The spreadsheet with all the results from this run can be seen here. 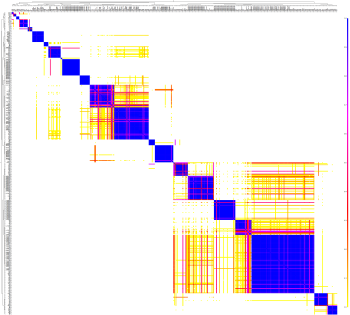 A table of Fst (genetic) distances between the eight clusters is available here. So why did I pick the results from K=8, and not some other K, like 2, 10, or 25? 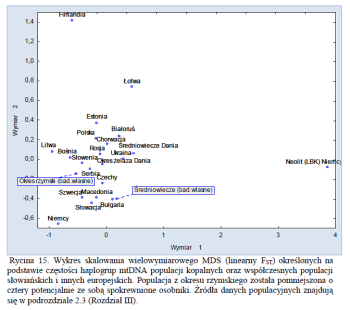 Well, it's not possible to evaluate who is more European without a European-specific cluster (ie. 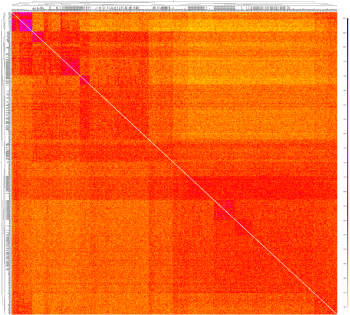 modal in Europeans, with a low frequency outside of Europe). Provided that a decent number and range of global and West Eurasian samples are used in the analysis, such clusters begin appearing at around K=5 or K=6, and start breaking up into local clusters from about K=9. I found that runs below K=8 produced European clusters that spilled too generously outside of the borders of Europe. 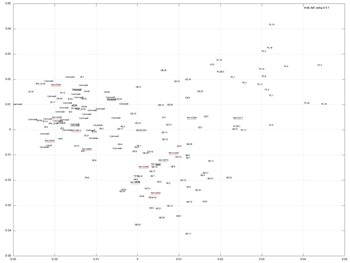 On the other hand, runs above K=8 produced European clusters that weren't representative of enough European groups (ie. too localized). But the European cluster from K=8 was pretty much perfect, and I think that's obvious from the map. In fact, I can hardly believe how well it fits the modern geographic concept of Europe - north of the Mediterranean and west of the Urals. Amazing stuff. There are two other clusters that show up across Europe in non-trivial amounts - Mediterranean and Caucasus (see maps below). These can also be thought of as native European clusters, since they've been on the continent for thousands of years. 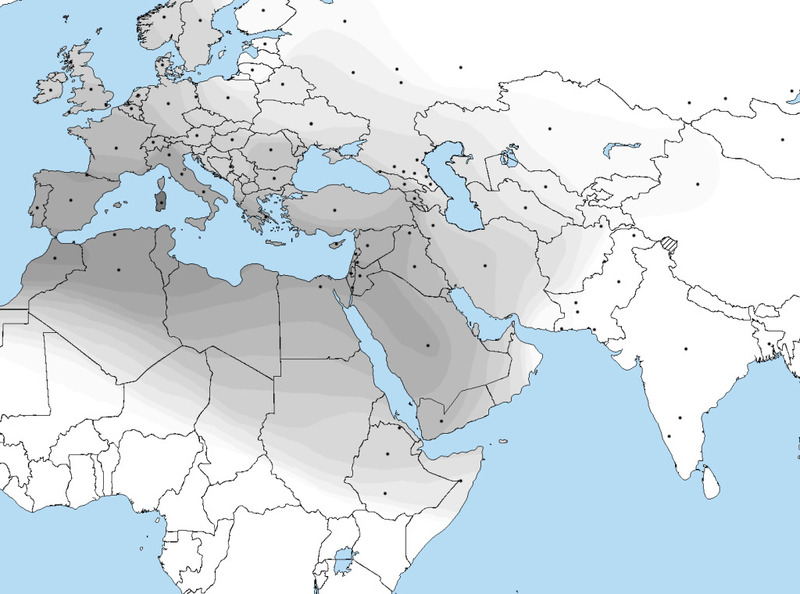 However, their peak frequencies are found in West Asia, so they're not particularly useful signals of European-specific ancestry. So what do these three clusters show exactly? They represent certain allele frequencies in modern populations, and in fact, these can change fairly rapidly due to admixture, selection, and genetic drift. 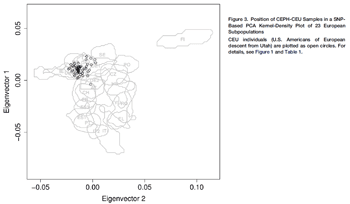 So claiming that such clusters represent pure ancient populations is unlikely to be true in most cases, if ever. However, I don't think there's anything wrong in saying that, when robust enough, they can be thought of as signals of ancestry from relatively distinct ancestral groups. Indeed, anyone who's read up on the prehistory of Europe, knows that there are three general Neolithic archeological waves to consider when trying to untangle the story of the peopling of Europe. These are Mediterranean Neolithic, Anatolian Neolithic and Forest Neolithic (for example, see here). Mediterranean Neolithic refers to a series of migrations from West Asia via the Mediterranean and its coasts. The areas most profoundly affected by these movements include the islands of Sardinia and Corsica, and the Southwest European mainland. Anatolian Neolithic describes migrations into Europe from modern day Turkey, mostly into the Balkans, but also as far as Germany and France. At the moment, Forest Neolithic of Northeastern Europe is something of a mystery. However, the general opinion is that it was largely the result of native Mesolithic hunter-gatherers adopting agriculture. 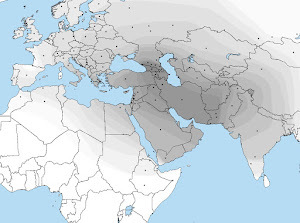 Obviously, it's very difficult to dismiss the correlations between these three broad archeological groups and the European and two European/West Asian clusters produced in my K=8 ADMIXTURE analysis. Is it a coincidence that the Mediterranean cluster today peaks in Sardinia, which has been largely shielded from foreign admixture since the Neolithic, and today forms a very distinct Southern European isolate? Why does the North European cluster show the highest peaks in classic Forest Neolithic territory? And why does the Caucasus cluster radiate in Europe from the southeast, which is where Anatolian farmers had the greatest impact? These can't all be coincidences, and I'm willing to bet that none of them are. I'm convinced that the three clusters from my K=8 run are strong signals from the Neolithic, and the North European cluster also from the Mesolithic. Eventually, these issues will be settled with ancient DNA data, in a much more comprehensive way than ever possible using modern genomes. We've already seen some preliminary results, mostly from Mesolithic, Neolithic and Bronze Age sites around Europe, so perhaps it's useful to ask whether my ADMIXTURE analysis and commentary here mirror these early findings? I think they do. For instance, here's an interesting conclusion regarding the East Baltic area from a study on ancient Scandinavian mtDNA by Malmström et al. Through analysis of DNA extracted from ancient Scandinavian human remains, we show that people of the Pitted Ware culture were not the direct ancestors of modern Scandinavians (including the Saami people of northern Scandinavia) but are more closely related to contemporary populations of the eastern Baltic region. Our findings support hypotheses arising from archaeological analyses that propose a Neolithic or post-Neolithic population replacement in Scandinavia . Furthermore, our data are consistent with the view that the eastern Baltic represents a genetic refugia for some of the European hunter-gatherer populations. I suppose there will be people wondering why I didn't take Sub-Saharan African, East Asian, and South Asian admixtures into account in my analysis. 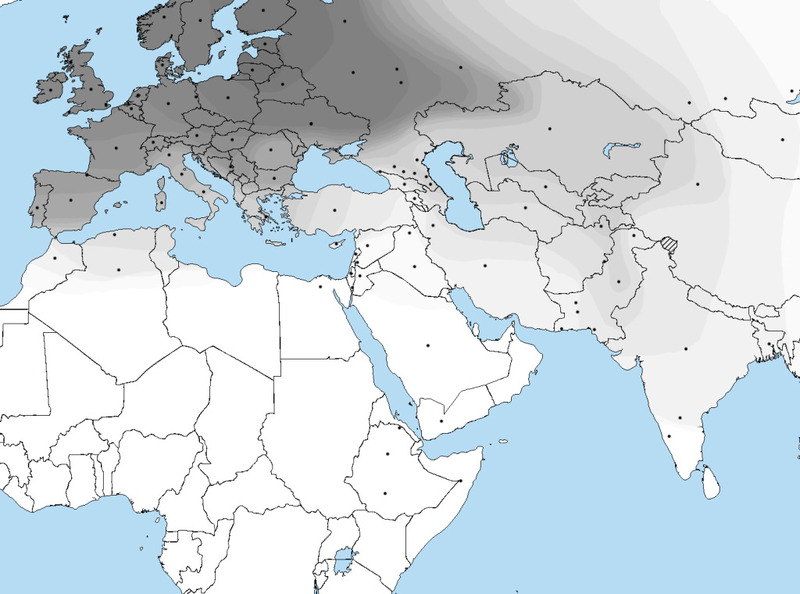 The reason is that I wasn't looking at which group was most West Eurasian, or Caucasoid. Based on everything I've seen to date, in my own work as well as elsewhere, the most West Eurasian group would probably be the French Basques from the HGDP. However, the differences between them, and certain groups from Northeastern Europe, like Northern Poles and Lithuanians, really wouldn't be that great anyway. I might do a write up about that at some point.